The first Queen Elizabeth of England was the daughter of Henry VIII and Anne Boyeln. Her sister, Mary, was queen and a devout Catholic, and she and her supporters wanted to keep Elizabeth, the next successor, from the throne. 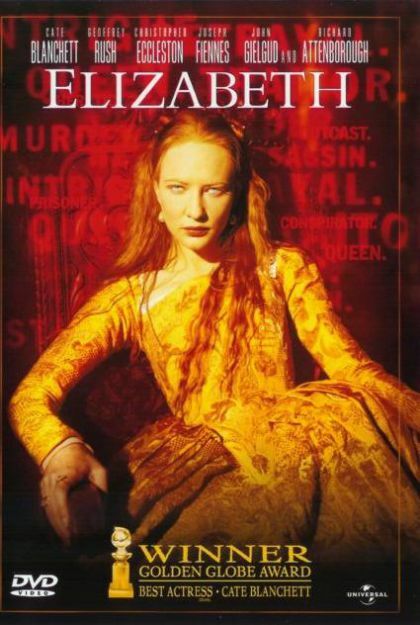 This film covers Elizabeth’s rise to the throne and dealing with some of those who plotted against her. It’s always a danger with a historical drama to believe everything that is presented. For example, Elizabeth is known as the virgin queen as she never married or had children. She is known to hold favour with Sir Robert Dudley. However, in the film, it seems that she had a sexual relationship before discovering that he was married. It’s good for the story, but perhaps not so historically accurate. Whilst I think that the portrayal of Elizabeth by the wonderful Cate Blanchett was extremely well done, it was Christopher Eccleston who stole the show for me. So evil and repulsive – he should be the next Bond villain. Now, to watch the sequel – Elizbeth: The Golden Years.